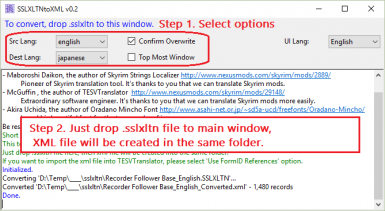 This tool convert to TESVTranslator's XML file from Skyrim String Localizer's SSLXLTN file. - Fixed an issue where can not be translated by the converted xml file in the latest xTranslator (probably 1.0beta14 or later). Technical note: To fix the issue, this tool will output a lot of useless translation records in XML file. 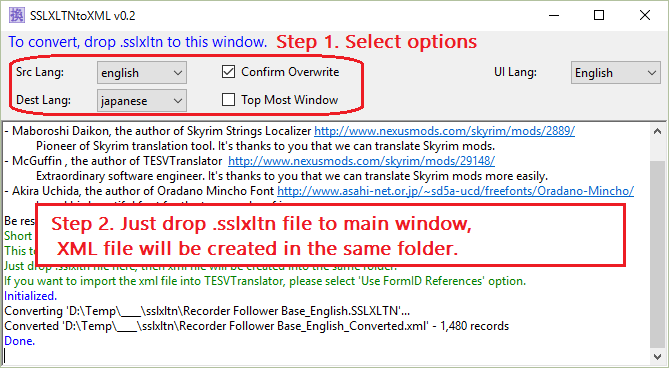 If you want to redistribute the converted xml files, be sure to export again with xTranslator. - You can now select files by "Open Files" button. If you can't drop files into tool window, use this button. - You can now specify the SSLXLTN files you want to convert to a command argument. - Now tool does not check the input file extension. - Support the Japanese as the UI language. - Improved UI and messages. - Improved the SSLXLTN reading error message (Add a line number). - Bug fixes for reading SSLXLTN line endings code. Just drop .sslxltn file to main window, XML file will be created in the same folder. If you want to import XML file into TESVTranslator, please select 'Use FormID References' option. Extract zip file to any folder (expect Program files folder). For uninstall, just delete installed files. This tool does not use the registry. - Src Lang : Select language that original mod's language. - Dest Lang : Select language that translation language (as SSLXLTN's language). - Confirm Overwrite : If checked, show file overwrite confirmation message. If unchecked, XML file will always be overwritten. - Top Most Window : If checked, The window is always in the foreground. - UI Lang : Select UI language. Currently, you can select the English and Japanese. 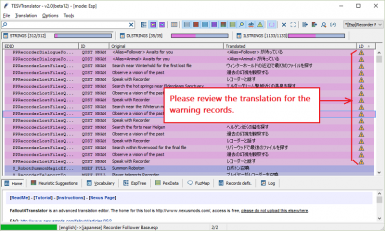 - Fix for xTranslator 1.0beta14+ : Check if you have the latest xTranslator (probably 1.0beta14 or later). 3. Drop .sslxltn file to window. 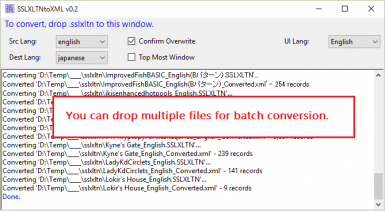 You can drop multiple files for batch conversion. If you can't drop files into tool window, use "Open Files" button. 4. Converted XML file will be created into the same folder. 5. XML Import dialog box will appear. Select following options, and click OK button. 6. It should be translated. - A warning icon (orange color) may be displayed in some records. All required information is not included in SSLXLTN file. For this reason, a translation target becomes vague. Please review the translation for the warning records. 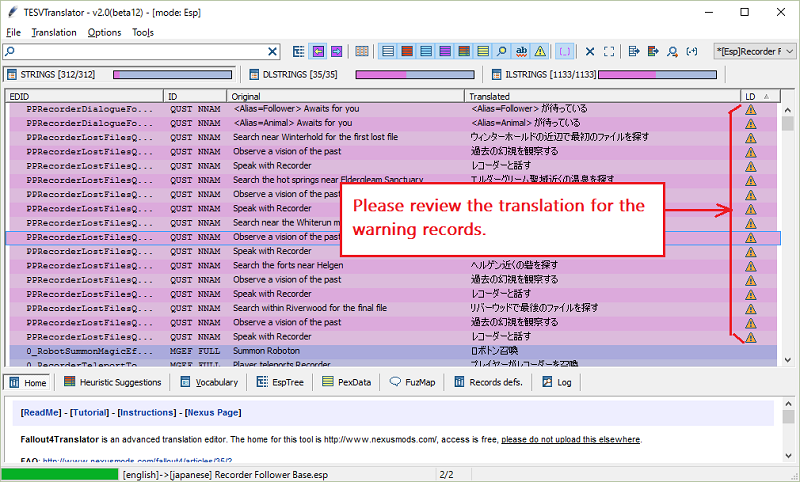 - To support xTranslator 1.0beta14+, this tool will output a lot of useless translation records in XML file. If you want to redistribute the converted xml files, be sure to export again with xTranslator. 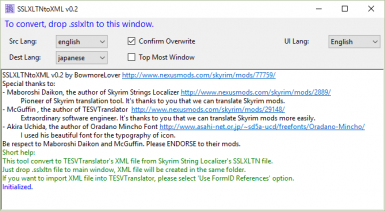 Be respect to Maboroshi Daikon the author of Skyrim Strings Localizer, and McGuffin the author of TESVTranslator. Please ENDORSE to both mods. Even if there is a problem in the translation using this tool, Do not bother Maboroshi and McGuffin. This tool is their unexpected things. Be respect the original translators (in other words authors of SSLXLTN files) especially when you redistribute the converted xml files. I used his beautiful font for the typography of icon.